It's all over but the shouting, "Allez!" 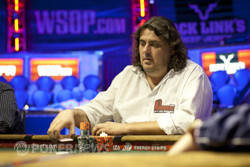 Antonin Teisseire has just scored another bracelet for France, their third of this 2011 Series. Teisseire will join Bertrand "ElkY" Grospellier, Fabrice Soulier, and several dozen excitable fans in bringing some American hardware back home to their country in a couple weeks. Teisseire is no stranger to tournament cashes, but he's not tasted such lofty success like this before. This is his largest tournament cash by a few hundred thousand, his first gold bracelet, and from the looks of it, one of the happiest moments in the life of this 65-year-old pro. We'll confess we were nearly trampled by Teisseire in the celebratory moments following his win. And now, as he and his friends gather on the stage for a few photos, the chaos of the moment has subsided a bit, and there are long-lasting grins all the way around. As the last flashbulbs pop, they break into song, chanting, "La-lala-la-laaaa! ", jumping up and down in excitement. 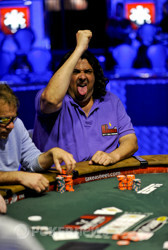 It's three cheers for Antonin Teisseire today in Las Vegas, the newest champion at the WSOP! Another Bracelet, Another French Win! Antonin Teisseire makes France proud! On his last shove, Darryl Ronconi was quickly called by Antonin Teisseire to put the former all in for about 1.5 million or so. He was at risk, and the news was not good. Teisseire's crowd rose to their feet, and he he gave them a wide-eyed stare as he realized he was potentially five cards from WSOP glory. The fans broke into chants just in time to see their man's dreams momentarily deadened as the flop brought . In near-silence suddenly, Ronconi let out a cheer of his own, arms up in the air as he'd binked the three-outer. The turn came the , though, and Teisseire picked up the flush outs. The noise returned as the French cheerleaders begged the dealer for a heart. "Couer! Couer!" they yelled at the stage, and their cries were promptly answered. The dropped off the deck on the river, and the crowd erupted in a French frenzy of celebration. Teissiere, who is not a small man, stampeded across the stage and into the arms of his spectators who were crashing the boards along the rail. A long celebration ensued with chanting and celebration and hugs all around. During the chaos, Darryl Ronconi was standing alone quietly at his side of the table, starting down longingly at the board that had just sealed his fate. His run for a bracelet has been cut short by just one spot, and he'll have to settle for $510,053 as a consolation prize. Congratulations, Darryl. Daryl Ronconi has open-shoved his last two buttons, and Antonin Teisseire has folded both times. As we type this, Teisseire moved all in from his own button on the next hand, and Ronconi folded. Did someone say, 'shove fest'? ... And as we typed that, Darryl Ronconi has just shoved the button again... And he was called! 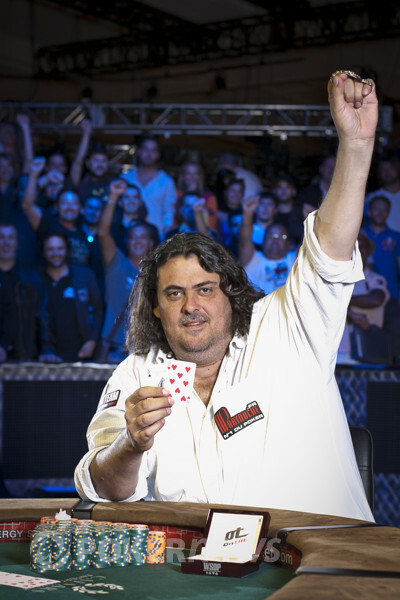 Darryl Ronconi opened to 335,000, and he bet another 400,000 on the flop. Antonin Teisseire took a minute or so to call the preflop raise, but he shoved all in quickly after Ronconi's flop bet. The American could not risk it all, sliding his cards in the muck to part with another 735,000 chips. Two hands later, Ronconi limped the button for the first time today. Teisseire's response? All in again. Ronconi laid it down, and he's running out of green chips now. He's under 2 million with about 1.7 to our eyeballs. Darryl Ronconi raised to something like 310,000 before the flop, and Antonin Teisseire made the call. 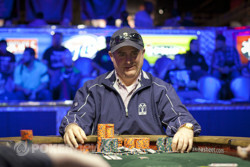 On the flop, Darryl Ronconi continued out with a bet of 425,000, and Antonin Teisseire check-called. The on the turn put two pair on board, and Ronconi tried again with 700,000 more chips. Teisseire hung around with another call, though, and the river came the . Check-check. Teisseire showed up for the bad full house, but it was still the best hand. With that pot, Teisseire is closing in on 10 million chips again, stacking up about 9.8 million. Antonin Teisseire was the preflop raiser, and he continued out with a bet of 300,000 on a flop. Darryl Ronconi check-called, and he check-called another 500,000 following the turn. On the river, the paired the board, and Teisseire was undeterred. He made it 1.125 million to see the showdown, and Ronconi could not call. He mucked, sliding back a bit to 4 million. That's about 8.2 million to Teisseire's corner. The cheerleaders have sort of segregated themselves naturally here inside the Thunder Dome. To our left sits just a handful of Ronconi's supporters and what look like random passers-by who don't have much of a rooting interest. On the right? The entire nation of France. We spot some familiar faces from the pro ranks, including Team PokerStars Pro Arnaud Mattern, Nicolas Levi, Davidi Kitai, Pascal Perrault, and Antonin Teisseire's fellow Partouche Team Pro, Alain Roy. We're familiar with both Roy and Teisseire from the 2008 Partouche Poker Tour final table, and it's nice to see they've brought some of their countrymen across the pond to make some noise here today. Antonin Teisseire with the French supporters. Antonin Teisseire and his friends celebrate Antonin's Victory. Antonin Teisseire is overcome with emotion as the French crowd dance and cheer. Antonin Teisseire, joyous after his victory. Antonin Teisseire winner of $825,604!